How come your codepen example doesn’t work when you link to a file on your FTP server? Often times it’s because of CORS, so I thought I’d share a few easy ways of dealing with this. Cross Domain/Origin, CORS /Access-Control-Allow-Origin/whatever-you-call-it can be a frustrating stumbling block for front end developers who simply want to use or share resources from around the web in their projects. I won’t go too in depth about CORS itself (you can read more here if you want to know more), but the gist of it is that, when a server doesn’t know who’s trying to access its data, it will turn them away unless it is specifically told otherwise. Now here’s me using that data via AJAX within D3.js. You can see I even have a TSV (Tab Separated Values) file in there. 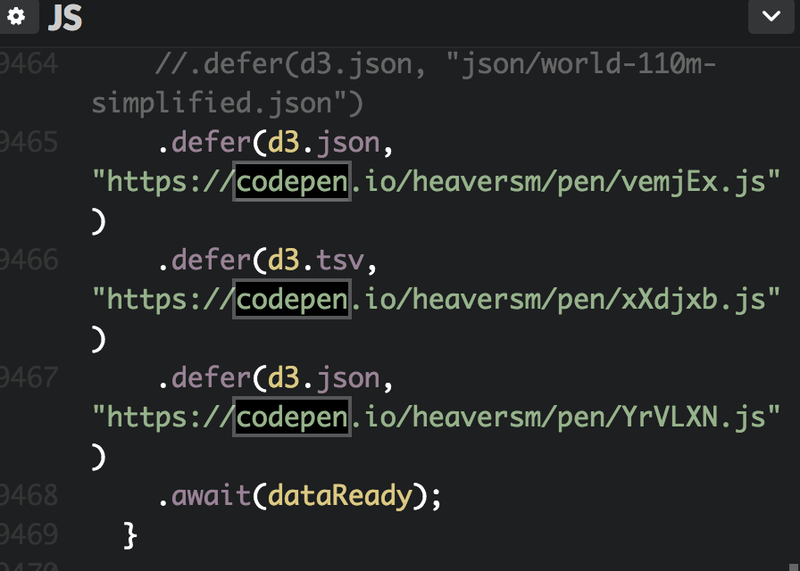 I just need to make sure my AJAX request specifies that the .js file it is linking to is actually JSON (or whatever file type you’re intending). 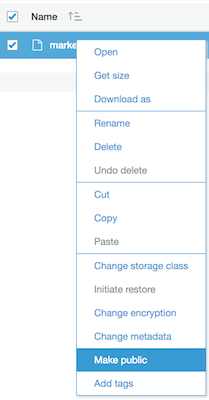 Fix #2: Use Amazon Web Storage. Chances are as a coder you’ve already had to deal with AWS / S3 in some way. It’s where some of the biggest, most popular websites around store their files. As a front end dev mostly involved with animation, styling, and data visualization, I haven’t had to deal with it much. But I have an Amazon account! And making an Amazon Web Storage account isn’t much more difficult. Head to their URL, create an AWS account, and then head into the console, where you can search for S3 (or use this URL) to get into the file storage console. Make a bucket (folder) for all your codepen files, then click into it and go Permissions > CORS Configuration to make sure that any files you put in this folder can be accessed from Codepen (or wherever else you want to give access to). Now, just upload your file, and right click it and select Make Public and you’re good to go! Using S3 to store your static assets is a good idea regardless of whether you’re trying to get around CORS — it’s fast, secure, scalable, it’s distributed to servers by geography, it’s backed up, there’s analytics, all sorts of good stuff. Anyway — there are various other workarounds — feel free to comment with your own. Hope it helps you get your codepens up and running. You can find all my experiments here. I’m hoping to add a lot more soon!